Squeaking this one in just under the wire. 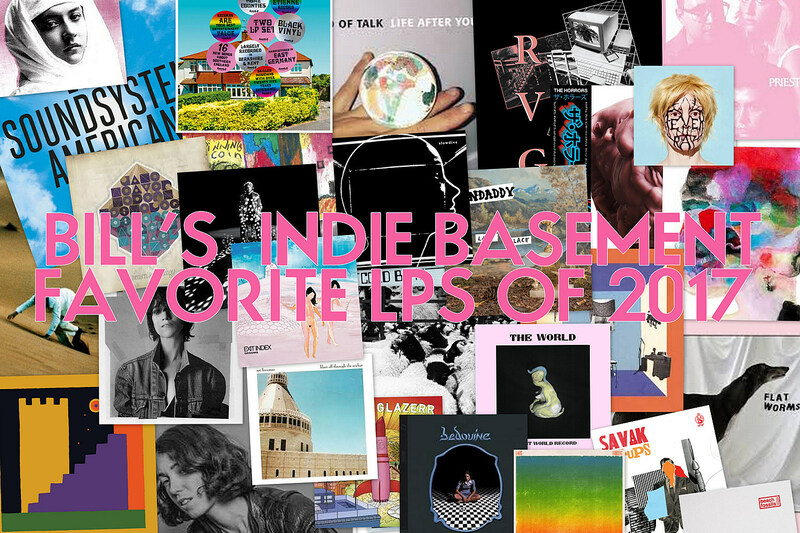 You’ve surely checked out the official BrooklynVegan Top 50 LPs of the year but if you’re wanting to score some pure, unfiltered Indie Basement year-end action, look no further (but do scroll down). These are my 30 most favorite records of 2017 to the best of my recollection. I included an “in a nutshell” pick for each, a song that more or less sums up the record, and there’s a playlist of all those which is all the way at the bottom of this descending order list. Need more end-of-year-lists? How about 20 great records made by indie and underground legends; Best New(ish) Artists of 2017; the Best Metal of 2017; and more. See ya next year. Baxter Dury figured out his style on 2011’s Happy Soup — lurid, wry character studies set to spare, danceable pop informed by Studio 1 reggae, Serge Gainsbourg and the pub rock/new wave his father made — but pretty much perfected it here. Was it the strings? As exemplified on the endlessly quotable single “Miami,” Prince of Tears is wonderfully sleazy, full of memorable songs and, as Jarvis Cocker noted in the year-edition of MOJO, “some really creative swearing.” No question, my favorite of the year. Despite people being cranky about LCD Soundsystem coming back at all after James Murphy had made such a big deal about ending things six years prior, I think American Dream proved to be a more than worthy return. James is still finding new things to say and new ways to say them while staying within LCD’s snarky dance rock realm. How Girl Ray’s three members, all still in their teens, arrived on such a specific, out-of-time sound — mossy pop, seemingly informed by the early ’60s but also stuff like Cate Le Bon and Gorky’s Zygotic Mynci — is a mystery. It’s certainly magic. No matter, it all makes for Debut Album of The Year for me. They made a great Christmas single this year too! If 25 years ago you’d have told me that Slowdive would make one of 2017’s best albums, I’m not sure I would believe you (that would also be a really weird, specific thing to predict), but here we are. A gorgeous, dare I say “mature,” update of their gossamer shoegaze sound. For me, no record faced the cruel joke that has been the last 18 months better, more head-on than Detroit’s Protomartyr. Joe Casey, bleakly funny, is just the kind of guy you want leading the charge and Relatives in Descent has some of the band’s most powerful, inventive rock yet. As a fan of mid-’90s UK electronic music in its many forms, I was instantly drawn into Kelly Lee Owens’ utterly modern, immaculate blend of techno, house, and trip hop elements. It’s a pop record, in her own way, and an album I’ve left on repeat for hours at a time. This year’s best surprise. Karin from The Knife dropped Plunge upon us, out of the blue, and this record we didn’t know was even coming turned out to be something we definitely needed. So good, so focused, so badass, so very now. Most importantly: so totally loaded with bangers. A gorgeous and often groovy record, as usual, from Charlotte Gainsbourg, with help from SebastiAn, Daft Punk’s Guy-Manuel de Homem-Christo, Owen Pallett and, believe it or don’t, Paul McCartney. All those guests are nice and all but it’s Charlotte, as co-songwriter and lyricist for the first time, that makes this her best record to date, singing openly about the loss of her sister and famous father, plus other tough subjects. Detached cool is cool, but this time it’s personal. Another record that fits right in with 2017. The unflinching politics are standard issue for this fiery DC band, but Nothing Feels Natural displays a new subtle side, too. Lars Finberg probably could’ve released Moon Over Bakersfield as a new Intelligence record and no one would’ve batted an eye. It’s still got all the surfing-at-angles sound and the skewed worldview that was evident way back on 2004’s Boredom and Terror. What makes this a “solo” record, then? Perhaps the lyrics, which are less detached, more personal. (His sardonic humor remains intact.) Lots of cool folks help out this time (Ty Segall, Mikal Cronin, La Luz) but it’s Lars’ show. Here We Go Magic main man Luke Temple reinvents himself as Art Feynman, filtering ‘70s slinky Nigerian funk and krautrock through charmingly loose, low-fi four-track recordings. It’s an infectious, fun LP, and quite possibly the best thing Luke has ever done. Hot Thoughts found Spoon in flux: back on Matador Records for the first time since their 1996 debut and without Eric Harvey (who had been part of the group for 15 years). The shake-ups did them very well. Hot Thoughts displays a newfound love of synthesizers, but the strut and swagger all over the LP are pure Spoon. San Francisco DIY genius Kelley Stoltz, who has a side career these days playing in Echo & The Bunnymen, merges two of his biggest influences for Que Aura: ’60s Summer of Love pop and early-’80s post-punk. All his records have charm but this one has a little extra spark, with every song containing an extra catchy hook, surprising synth line, great arrangement or other clever flourish. I had forgotten how much I liked Land of Talk till they came back after five years of hibernation, and this new album is just what you’d want from a return: everything you liked about their old stuff (understated by terrific performances), with great new songs and production (courtesy of Jace of Besnard Lakes who also played in the live band for a while). Classic indie rock is alive and well and residing in Montreal. It was so great to have Grandaddy back after a 10-year hiatus, with an album that picked up right up where they left off in all the best ways. The band’s easygoing style — fuzzy guitars, arpeggiating synths and frontman Jason Lytle’s world-weary vocals — is ageless and Lytle’s lyrical themes of alienation in a world of creeping urban development and technological advances, seem more pertinent than ever. There is a sad, lonesome quality to Meg Duffy’s voice that seems intrinsically linked to the dreamy, wistful music she makes as Hand Habits. Having been a go-to guitarist for a few years now (she is Kevin Morby’s secret weapon), she established herself as an artist in her own right with this wonderful record. The 2017 Most Improved Band award goes to Cherry Glazerr. Clemetine Creevy already had the songs, but putting together a new, more accomplished lineup of the band made all the difference in the world. Apocalipstick is roaring with confidence, bratty arrogance, and an abundance of memorable riffy jams. Does we need another band that sounds like Liliput, X-Ray Spex and Delta 5? Yes, and that band is Oakland, CA’s The World who play scratchy, sax-attack punk like they invented it. Add to that an of-the-moment “everything is terrible but let’s dance” outlook, and First World Record might be this year’s end of the universe party soundtrack. Bedouine’s debut album is everything I like about the softer side of the early ‘70s, landing stylistically somewhere between Karen Dalton and Karen Carpenter. With the swooniest strings of the year (courtesy of the Spacebomb house band), it’s a an absolutely gorgeous deep shag rug of a record. Made at the now-shuttered The Magic Shop (they were the last band to record there) with the same trio lineup as 2015’s great Comb the Feelings Through Your Hair, this is a further refinement of that album’s style: sleek, dark, alien. Slinky rhythms intertwine with heavily treated guitars and minor chord melodies. Jane Weaver has been exploring the outer reaches of psych folk and pop since the early ’00s, including 2010’s Fallen by Watchbird and 2014’s The Silver Globe which saw her embracing droney prog influences. Modern Kosmology is a record that takes The Silver Globe‘s sounds even further, folding in icy synthpop, krautrock grooves (including an appearance by Can’s Malcolm Mooney) into her otherworldly sound. It’s a gorgeous, groovy record. That NME compilation C-86 has spawned so much music over the last 30 years, and so much of it wimpy and forgettable indiepop. But take folks who have played with Ty Segall, Kevin Morby and Wet Illustrated, and you get this LP of buzzsaw rippers for the Vespa set. Following two band-oriented Cold Beat albums, Hannah Lew (ex Grass Widow) went solo, warming up her minimal postpunk sound in the process without sacrificing any of the first two LPs’ edge. Melody is more to the fore, with more synths, and a batch of terrific songs. After a couple of albums where The Horrors sounded more obsessed with synthesizer settings than the songwriting, they enlist hitmaker Paul Epworth (who worked with The Futureheads and Bloc Party before hitting paydirt with Adele), go new wave and make their best record since Primary Colours. Bob, Pete and Sarah travel to the London suburbs of their youth (the “home counties” of the title) for this loose concept album that, musically, offers a sophisticated melange of everything they’ve dabbled in to date. As always, pure class (and a lot of fun). A mix of so many things I gravitate to, specifically nervy, mutant guitar pop (XTC, Television, Feelies) and Frenchy things. I have no idea what they’re singing about and it doesn’t matter. (It never stopped me from liking The Cocteau Twins.) Creative energy abounds in every track, and they put out a great collaborative single with Halo Maud this year too. Made after their lineup really solidified and toured a whole bunch, Cut-Ups showcases a stronger SAVAK. Chief songwriters Sohrab Habibion and Michael Jaworski were in closer orbit with each other as well, making for a more cohesive sound that, at times, escapes beyond their punk/post-punk roots. Most Improved Band #2: After two albums on Captured Tracks, Dustin Payseur started his own label (Bayonet) and reinvented Beach Fossils. He burned off most of the haze, opting for a much more refined pop sound, awash in chiming guitars, mellotrons, harpsichords, and synths. The songwriting is more sophisticated too, making Somersault effortlessly enjoyable. Melbourne’s RVG make Australian alt-rock the old fashioned way, recalling ’80s greats like The Go-Betweens, The Triffids, and Hunters & Collectors. At the center is singer/guitarist/songwriter Romy Vager whose confessional, raw-nerve lyrics and impassioned delivery go hand-in-hand with the stirring, anthemic music RVG make.